Welcome to my web site, please browse through the Landscapes and Animal Portraits, Seascapes and Townscapes, I hope you enjoy my paintings! Born in St.Ives in 1969, I have always studied art even as a child any free time was used to draw and paint. I have worked in art related areas since leaving school, illustrating books and various private commissions. Studying at Falmouth College of Art firstly for my art foundation diploma and then for my B.A hons degree. Since completing my degree I have painted full time as a professional painter, taking over Emanuel gallery in 2001-2010, after painting for the gallery for 12 years previously, I have recentely sold my Gallery in St.Ives so I can dedicate more time to my painting. My name is a mixture of Keran being Cornish, Sunaski which is Polish and Gilmore being Irish, a bit of a Heinz mongrel there. I am also female which is not evident from my name I know. My mothers family are all from St.Ives and were all fisher folk, my grandfather William Care, known to all as Willie Bish even wrote a book about his life and his fishing ‘My three score years and nine’. My great grandmother was known as Scottish Annie, although she had lived in St.Ives since she was in her teens following the fish around the coast, one of the kipper girls, and finally meeting my great grandfather here in St.Ives. My father’s family were Jews who escaped persecution by leaving Poland and building a new life in the U.K, this is the religion that I follow, with a little bit of wiccan thrown into the mix. I have great interest in Polish and Russian expressionist work. I tend to paint in any medium that suits the purpose of what I’m trying to achieve, I favour watercolours in an unconventional way, and I am very interested in the way the paint itself behaves under different applications. I love to paint the landscape especially in severe weather, rain, sleet, hail and gales draw me in and every storm is so unique. The light and the movement of the foliage are what I try to capture, the brief moment that will never happen again. It is nice that a wide audience appreciate my paintings as I have collectors all over the world from Australia, New Zealand, Japan and all over the United States and throughout Europe. The next stage in my life is to get my paintings into galleries elsewhere, I have most of my work in Art House, Island Road, St.Ives and I also show at Ardent Gallery, Brecon, Wales. I live and paint full time in St.Ives,Cornwall which is my hometown. St.Ives is a must for all art lovers, we have the Tate gallery here and a host of other art galleries, not to mention superb scenery & surf. I have a wide selection of my original paintings on view on my website here and on my Facebook page Keran Sunaski Gilmore Artist. If you'd like to view any of the paintings and are visiting our beautiful town, just give me a text on 0777 3333 289 or e-mail kerangilmore@hotmail.com. Alternatively pop into ArtHouse Gallery on Island Road, they have the majority of my new work. Hope you enjoy the web-site it shows a cross section of my work. New work is always available which may not be on the site yet. 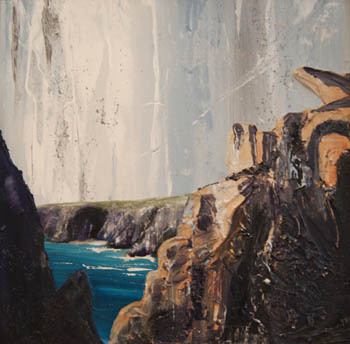 "The Cornish landscape surrounds me, I capture the dramatic change in light and mood."